Some readers choose their books based on their covers. And some women choose their perfumes based on the bottles. I am sometimes both that reader and woman. I first started getting interested in department store perfumes around the age of 15 or 16. I was shopping with my grandma, who desperately wanted me to pick out a perfume. The problem was, I wasn’t attracted to many of the bottles, and when I smelled a few of them, I still wasn’t impressed. These days I have a rather large collection of various perfumes collected from any number of retailers. The first perfume I ever bought (well, if we’re getting technical, my dad bought it) is still my favorite, but now it has some serious competition. A few weeks ago I read a book called Forever Lily. 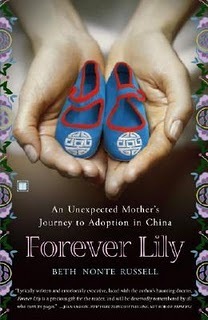 It was about a woman named Beth Nonte Russell who traveled to China with her friend Alex, who was picking up the daughter she was to adopt. In a surprising turn of events, Alex decided she couldn’t adopt the little girl and asked Beth to take her instead. More than anything, Beth wanted this little girl to be hers. Beth and her husband later adopted the little girl and named her Lily. Beth couldn’t forget the images she saw in China of how the children were cared for in the orphanage. When they first met Lily, her muscles were atrophied and she couldn’t walk. Beth knew she had to do something to raise awareness of this horrible mistreatment, and so she started the Golden Phoenix Foundation, which aspires to end child abandonment worldwide. She also created the fragranceForever Lily, which is sold through the company GoodTrueBeautiful Inc. 10% of all purchases you make on that site are given to the Golden Phoenix Foundation, a very worthy cause. I fell absolutely in love with the bottle and the special collectors’ edition case in which it came. The case is a blue and red cylinder with a metal clasp. The two sides part to reveal the bottle of Forever Lily displayed in the center of the cylinder. The bottle itself is elegant, and the liquid inside shimmers and sparkles. I especially love the bottle topper. The collectors’ edition sells for $125.00 for 3.4 fl. oz., but there are other options for this unique fragrance as well. A 3.4 fl. oz. bottle is also available in a signature box for $95.00, a .125 oz. is available as a rollerball for $25.00, and there is even a lotion available for $45.00. I’ve worn the perfume several times now, and was pleased that the scent remained on my skin throughout the day. I have received a lot of compliments on it and happily told those who asked about the Golden Phoenix Foundation and Beth Nonte Russell’s memoir. The perfume is not overpowering or sickeningly sweet like some women’s perfume. It’s unlike any of my other perfumes in that it’s spicy, yet feminine. Forever Lily will be my “special occasion” scent, or the one I choose when I just need a pick-me-up or some pampering. Perfume is one of my favorite luxuries! 10/26 entry: I voted for Simply Stacie on Picket Fence Blogs.